No one wants to leave money on the table, so why do some local Media Companies lag behind others in realizing the kind of digital revenue opportunity our Audience Extension product provides? 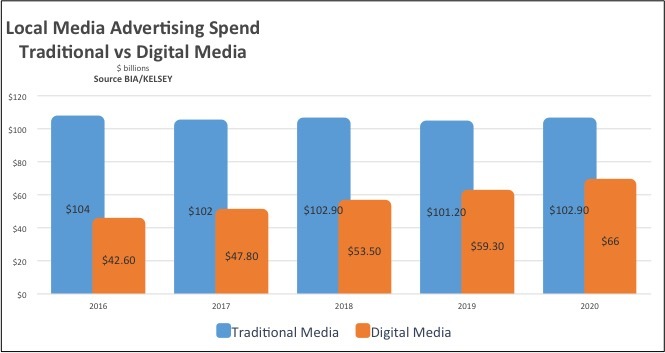 Take into consideration that the good news according to the graph below from BIA KELSEY, is that Traditional Media remains flat through 2020; which is better than some have feared. In fact, I think this number will stay flat, increasing and decreasing a little each year, beyond the five years shown here. As we see Millennials finding their careers, having families, and seeing the need to share media options, like many families do, Traditional Media will be a staple in their lives. Yes, they will still be leading the way in solo digital, which is why we are seeing digital dollars increasing in each of the next 5 years. So let’s look at what the real digital opportunity is in your local market. We have picked a market size of 100,000 people so you can imagine what is possible in your market by doing some simple math. You may think that these numbers are impossible, but it just takes dedication and making a concerted effort to make selling digital a priority to get your share of these digital dollars. Below we have shown a number in this example that has 11 digital companies earning $13,253,735 in this market of 100,000 people. As a digital selling entity along with your traditional media sales, you can make at least 1/11th of this amount, or $1,204,855 in digital revenue to add to your traditional media sales. Pinch yourself, you are not dreaming. Our company has created a one-of-a-kind digital media product that makes your company the only game in town selling a Premium Product. Any media seller has to differentiate their media selections to compete in local traditional sales. We give you the built-in digital program, that let’s your sales people differentiate your offering to sell digital media along side your traditional media. You can be sure that of the 11 digital sellers in your market, that 10 of the other sellers are literally selling the same cookie based product. That is why having exclusivity in selling our “cookie-less”Premium Product that has 100% local reach, 100% Transparency, and 100% Viewability, you automatically have an edge against your local digital competition. The reason I mentioned using the Full Scope of Our Service is because some of our clients don’t realize that we have an answer to every objection, and selling strategies that will definitely improve your digital sales. Here are a few of these strategies. 1. Give your sales persons a digital budget for your next fiscal year. 2. Make 1 advertiser type like Dentists one week, or Pet Stores another week as a priority with a new advertiser type each week. 4. Set up Advanced Training for your sales people with your Aqua Media Direct team. We’re serious about helping our clients achieve meaningful digital revenue. If your not nearing the potential of digital revenue for your market, get in touch with us today!